After the Breaking – What? Melting…that’s what. Something bad happened, and you were broken. Something bad happened and I was broken – eight years ago. That was an extreme disappointment, which caused me to look at myself pretty hard. Why had it happened. Then I started chocolate. 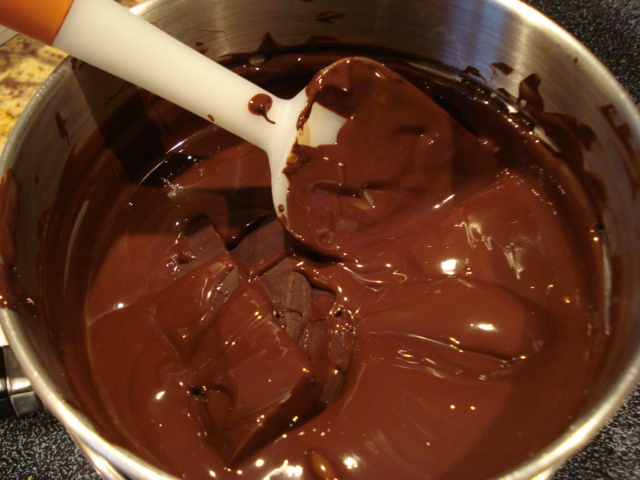 And I discovered that the process I put chocolate through is much like what we call refining fire. We all go through refining fire. It’s the HOW we go through that matters. We could be bitter, angry, or vengeful. But that doesn’t do us any good at all. But in the midst of all this, we feel like we’re melting, don’t we. Just as I melted this chocolate. I had a physical break in March. My melting, manifested as “meltdowns.” Sometimes, even more than one day – as my frustrations grew. These frustrations – what were they? Little things…little things I couldn’t do anything about at the time. So, I vented. My poor husband got to hear it all…bless his precious, sweet heart. I’m through with physical therapy now, and mostly, my wrist is well. “They” tell me that the one direction (bending forward) may or may not come back fully – because it hasn’t. Sigh…I was so determined to get it all back. The good things about my improvement – I’m not obsessed with the wrist anymore. I can think about other things. I don’t even have to wear anything on my good wrist – because the broken one is helping that much again. If you feel you’re in a melting pot – melting down emotionally – find a private place to let it all out – or a trusted friend or family member who loves you just the way you are, who can love you up while you’re melting down. I’m glad you’re doing better! Thanks for sharing out of your experience with hurt.